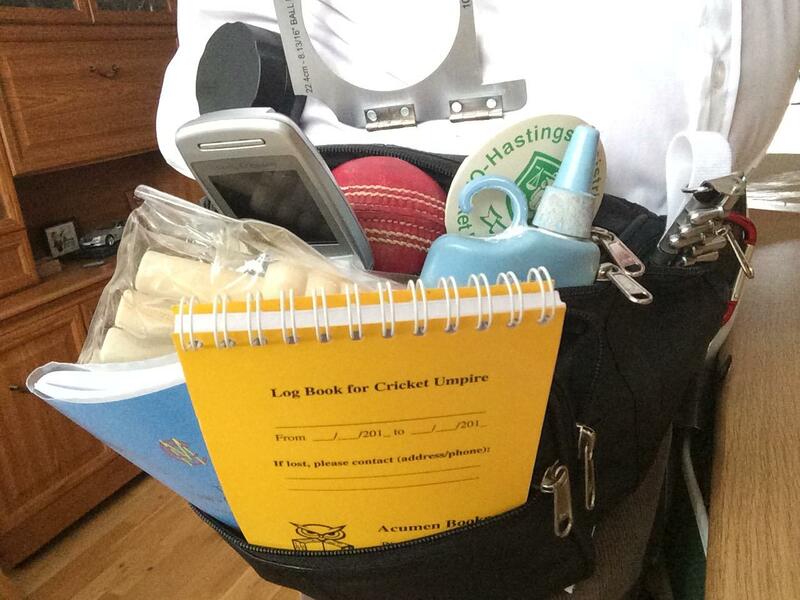 Acumen Books for Cricket Umpires, Scorers and Coaches "Albatross Partnership"
Every Accessory that a Cricket Official (Cricket Umpire or Cricket Scorer) needs - and now several items for Coaches. Open Learning manual, Textbooks and Training Videos from UK & Australia, Law Books in English, Urdu, Maharati, Scorer's Pens, Action Counters, ball and run counters, ball gauges, bat gauges, sweater loops, tethered bails, Wisdens. 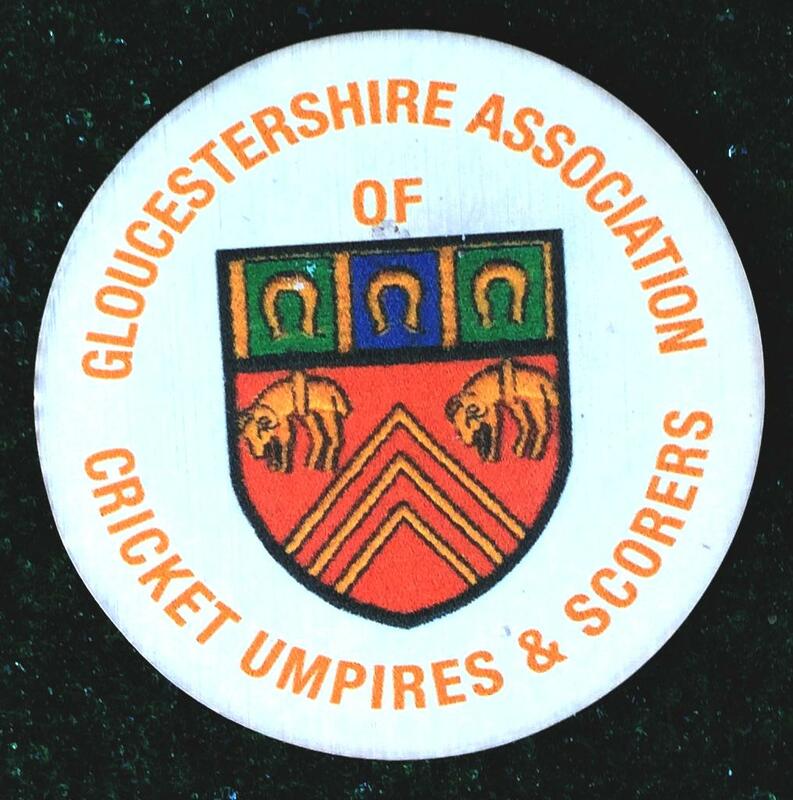 We buy and sell older books but only those relevant to umpires or scorers. Many agents and contacts around the world who would welcome invitations to set up bookstalls at meetings- full address in window above. to buy local books visit Books about Audley. Betley, Madeley click to view cricket books from India. SORRY our e-commerce site is temporarily unavailable - just email or phone your orders. Some items are on eBay. These are not just introductory prices and will normally be available from Acumen Books at competitive commercial prices. We also choose the most economical delivery method depending on weight. HOWEVER, please be aware that several local associations are arranging specially discounted one-off supplies to be distributed at their meetings. Whilst we cannot compete against these prices, do please remember we offer books in bulk on sale or return basis and will supply known customers before we receive payment. 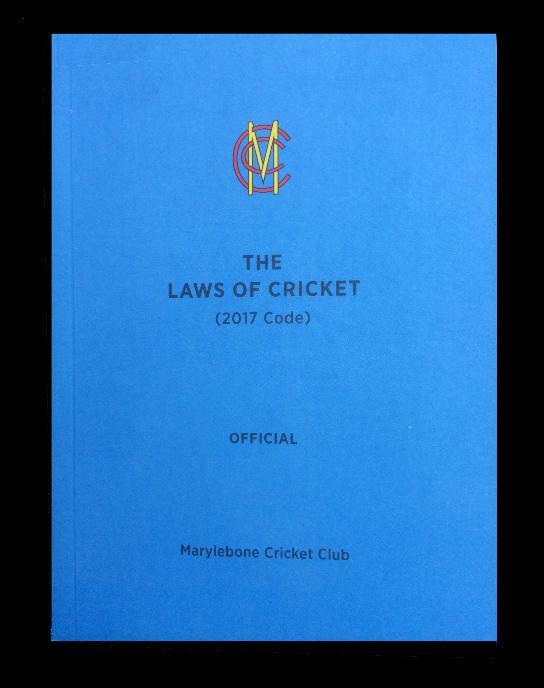 Several changes to MCC Laws 2017 (1st Edition) have been notified to come into effect on 1st April 2019 but the booklet (2nd Edition) has not yet been published. 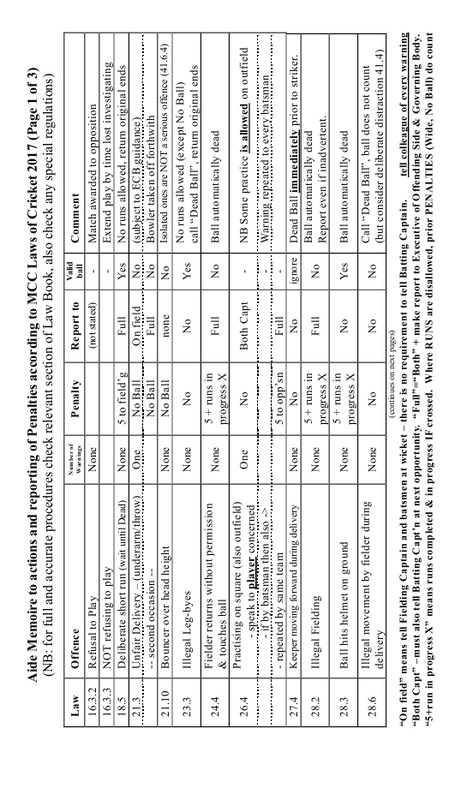 More details can be found on http://nompere.proboards.com/posts/recent including a cut and paste summary of the changes to 1st Edition - which is still on sale at a reduced price. Visit the discussion board regularly and subscribe to our quarterly newsletter for latest news. I do have difficulty in keep both websites, the discussion board, eBay and the newsletter all in step! Please bear with me. 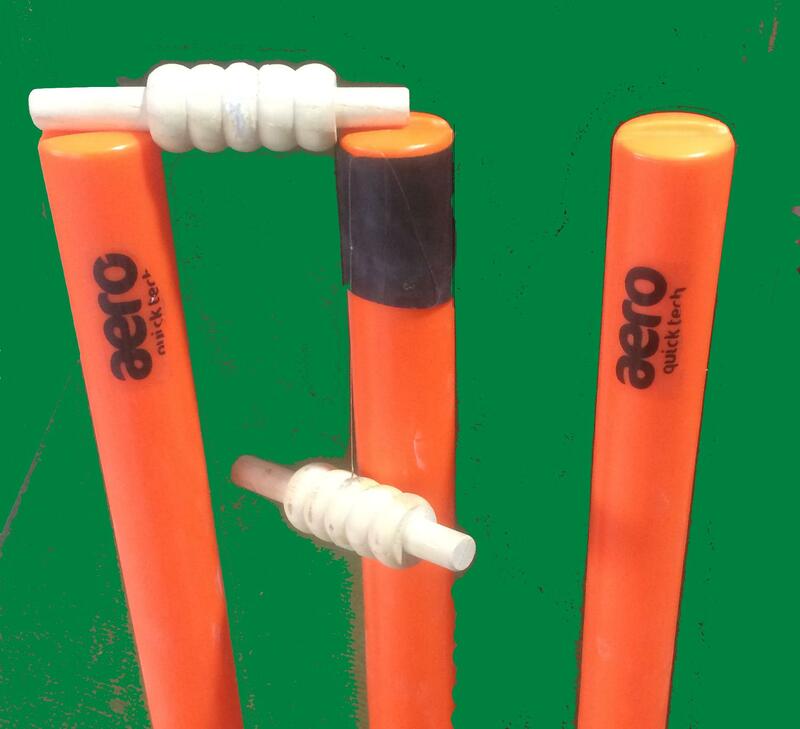 TETHERED BAILS - will slip on (and off) all existing stumps - no need for carpentry! FIELD RECORD (OVERS) CARDS - we are still selling West Surrey (approx A6) but are introducing a card which will enable recording more times and other information required for 2018. 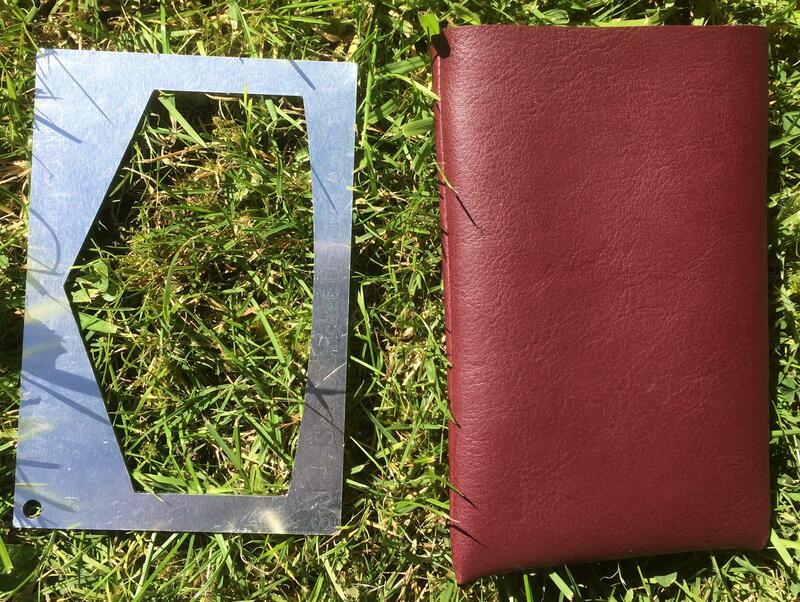 The print is larger - on an (approx) A5 size card designed to be folded in half whilst being used and kept in pocket. LOG BOOK - fully updated quick reference material as well as extra timings - available by end March 2018 - special offer £10 inc UK p&p provided cheque sent by Royal Mail. 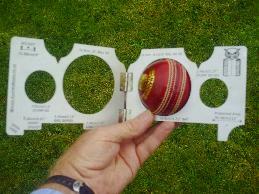 BAT GAUGE - need I say more? MCC LAW BOOKS - always the latest edition. TOM SMITH - still awaited - we guess at least three more months - possibly June 2018. We regret to announce the death of Ian Forrester of Shrewsbury, aged 61. He had umpired in Minor Counties and a number of leagues for many years before ill health forced him to retire from the field. Recently he has been helping with Observations in Staffordshire. We regret to announce the death of Fred Godson, aged 77. He was an Elected Councillor, Regional Scorer Officer, Umpire Instructor and started scorer courses in the North East passed away on 7th October 2017. He “resigned” from all things cricket a couple of years ago but was still helping maintain the ground at Percy Main CC and last year assisted with a scorer course in Northumberland. 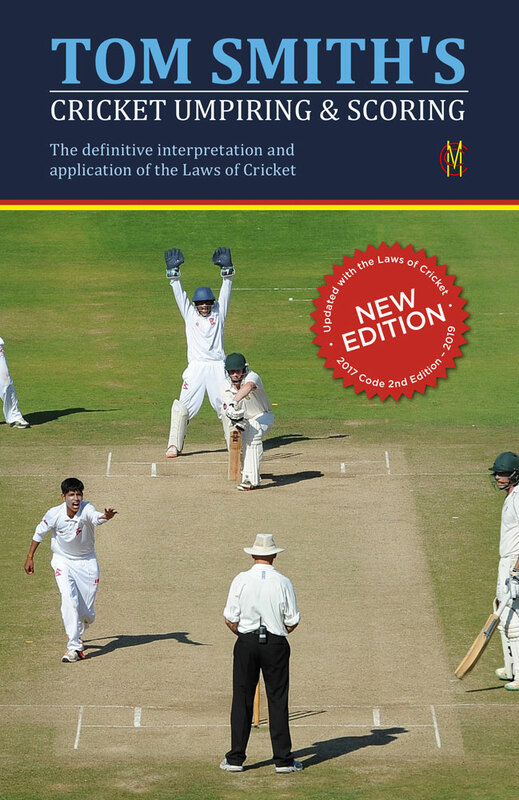 He had also been working his way through the new MCC Law book and making notes whilst in hospital. (apologies for any glitches, our site is undergoing an overhaul - in light of new postal rates and regs - new MCC Laws and a new ISP !) - you may need to click on some of the X to display or activate the relevant link (can anyone tell me why it does not display automatically?). 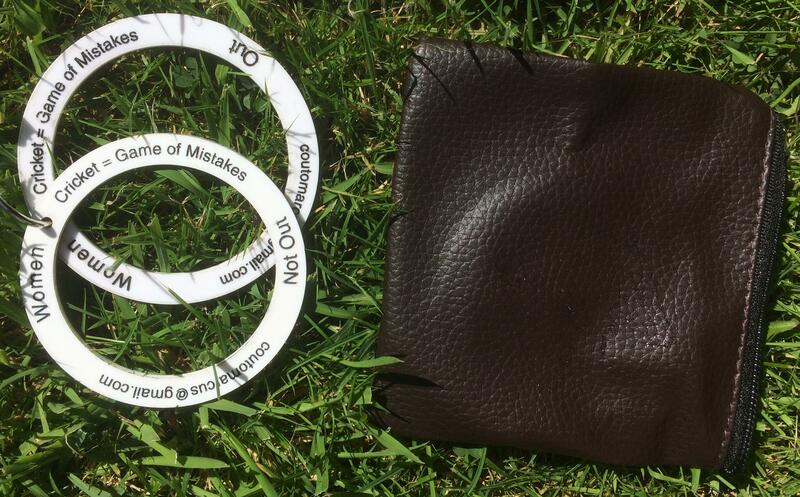 using this gauge in its handy pseudo leather pouch. can be combined with other items at £1.95 each. 05mar16 UPDATED EQUIPMENT WEB PAGES – or click on picture below to go to that section. Cathy Rawson reports that Brian Molloy passed away over the weekend (2/3 January 2016) in Poole hospital - A summary of his ACU&S career can be found here. a few 2015 Law Books available – £0.50 plus p&p. – we have been negotiating, settling in, packing & unpacking 40 years of possessions! Please be aware that Val Bowers is no longer with us – I will remove all such references in due course. 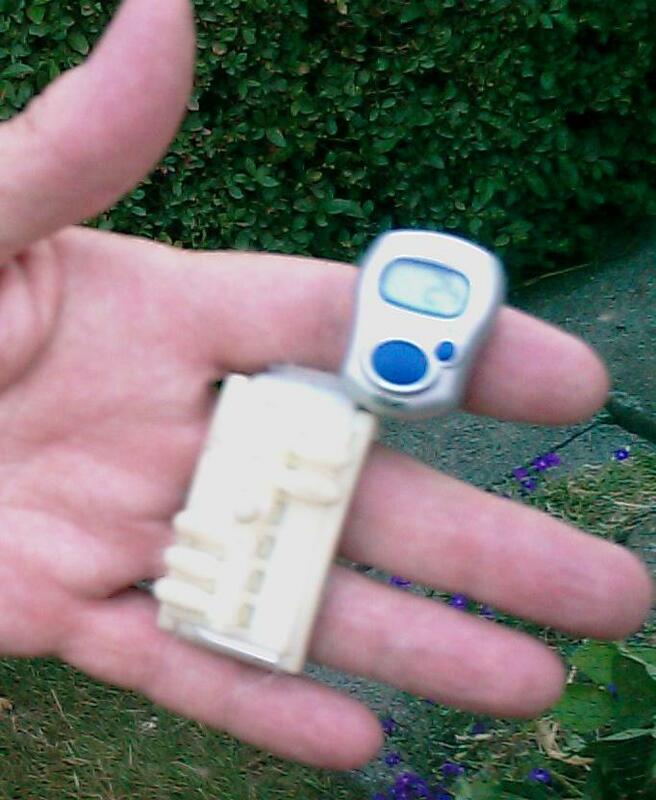 ALSO free robust plastic lever counter with 100 or more. SPECIAL OFFER send cheque for £3.75 (inc UK p&p) payable Acumen Books before 31st October 2013 - this includes FREE plastic cover! You cannot get better deals anywhere else! We now apply a standard £3.00 charge on almost all UK orders irrespective of size – please email us to check for very small items. 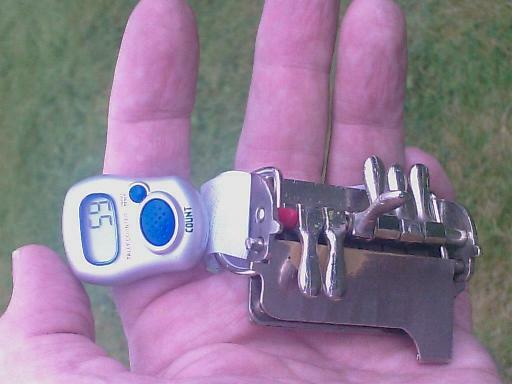 We have good stocks 6-lever counters - both in plastic and metal. We also offer cheapest retail price on 2010/2011 Tom Smith's at £9.99 ex-stock although we do have to add postage on small orders. with FREE transparent plastic cover. 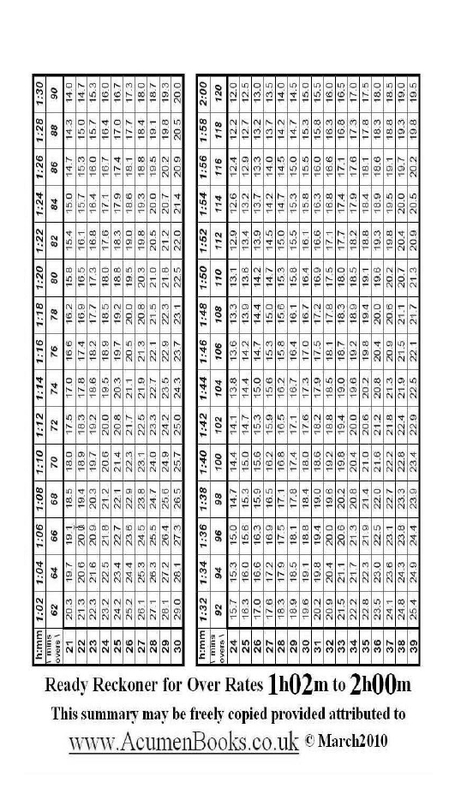 special BULK prices for 30 or more copies. In all cases, email your requirements to office@acumenbooks.co.uk with subject starting “Want ...”and we will quote postage, payment method and availability for delivery. Actual production pictures from manufacturer. NB we have made it asymmetric so that you should not get confused as to which way you are counting! Also levers protrude slightly for ease of use. 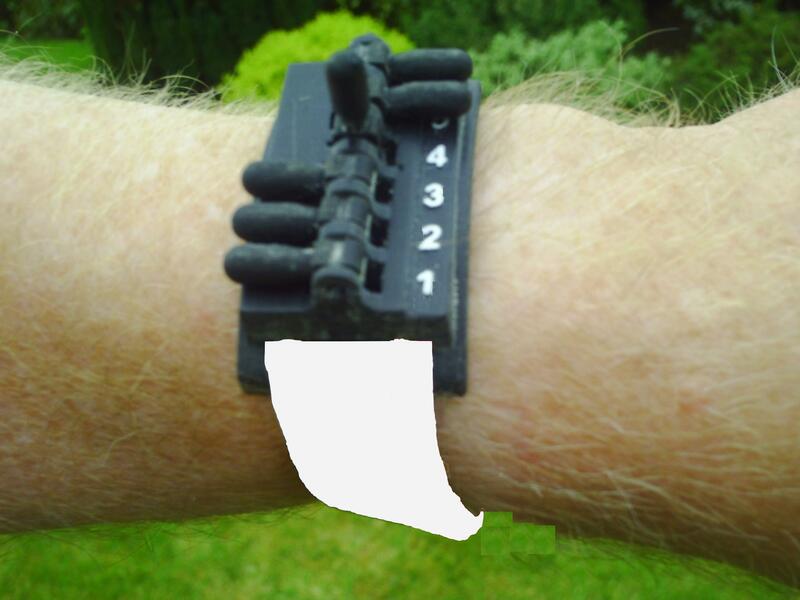 Band2009 shows how it might be worn on wrist. 20mar10 – several plastic and aluminium versions of multi-gauge now available. 12mar10 - www.sasportscoaching.com SA Sports Coaching based in Yorkshire run jointly by Sam Anderson (ECB Level 3 and former Yorkshire CCC Academy coach) and James Finch (ex Yorkshire CCC all rounder). 08mar10 – please be aware that there will be no despatches between late March and mid April 2010 due to staff holidays – we do not advertise exact dates to minimise risk of burglary (not that I can imagine our products would find a ready black market in the local pub!) - bear with us if you get no reply to emails or phone messages. 10feb10 – West Ilsley CC have a very interesting advert for cricket umpires at www.westilsleycricket.net/The%20Devils%20challenged%20the%20Angels%20to%20a%20game%20of%20cricket.pdf . 14oct09 www.sundaytimes.lk/091018/News/nws_26.html reports Ajith Perera's historic judgment against Government of Sri Lanka forcing them to implement international treaty obligations on building regulations for disabled access. Congratulations to Idiriya campaign. 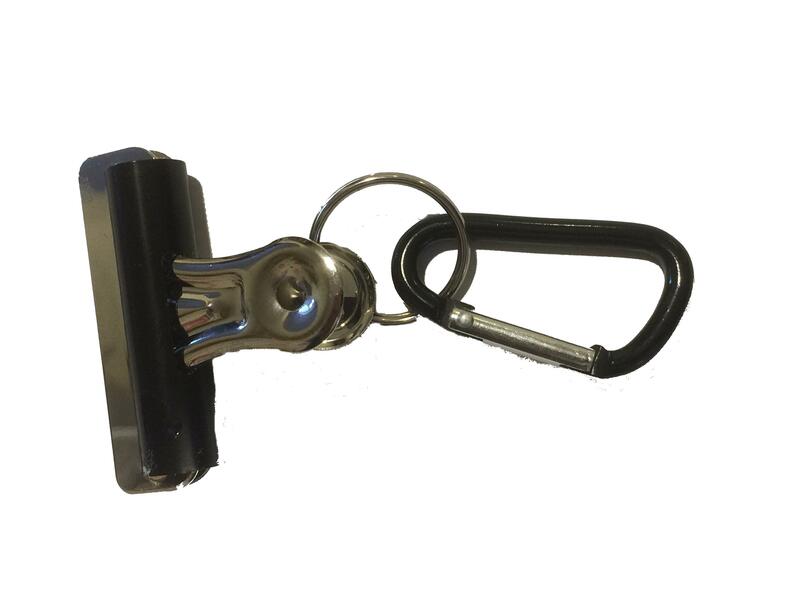 Small electronic counter (£9.99) together with lever counter and strap (new-£75 in 2011) can be held conveniently in one hand. 11jul09 – Robbie Robins died 09jul09, several obituaries can be found at http://nompere.proboards.com/index.cgi?action=display&board=obituaries&thread=361&page=1 and you are invited to share your memories there. 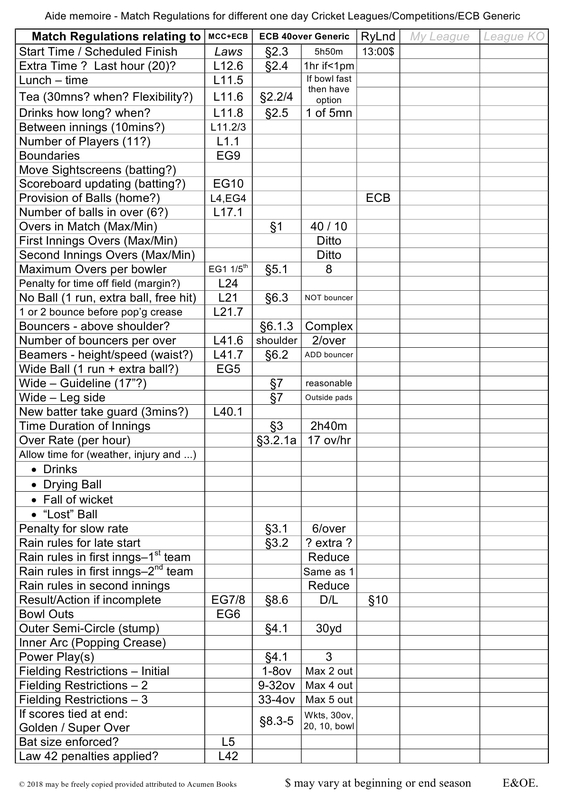 (c) draft level 1 umpire examination syllabus is now in circulation. 23may08 – Rubber Bowlers Markers – YOUR OWN LOGO late Summer – depending on demand mailto:office[AT]acumenbooks.co.uk?subject=WantLogoMarkers with some idea of the image required by your league, club or advertiser and the quantity concerned to obtain a quote. Acumen E-Newsletter 3 despatched 11 Nov 07 – follow subscribe link above to receive next edition using Google Groups. 21oct07 – Don Kirkby's revision question books now available – see www.acumenbooks.com for more details. 14oct07 – Tom Smith has been reprinted but still the 2006 edition, containing amendments to pages 137, 196, 223,265,275,297,302 and 313. 30jul07 – ACU&S General Council met on Wed 24th July to consider holding a ballot over the latest proposals from ECB – www.acus.org.uk for more details. Mike (H.E.N.) Starr, Life Vice-President and former Chief Examiner Orals. Former Chairman, Editor, Training & Exam Board Chairman etc. died in October of a rare viral infection, aged 44 year, a tragic loss. Tony Barton - Funeral Friday 25 August, 2.15pm, Haycombe Cemetery, Whiteway Road, Bath. International (1983-1988) Cricket Umpire Padmakar Pandit died in a road accident in India recently. Tony Davies of Crewe, a very long serving member of various umpiring organisations, especially widely known as ACU&S Overseas Examinations Officer .http://www.thesentinel.co.uk/displayNode.jsp?nodeId=158316&command=displayContent&sourceNode=158309&contentPK=14940996&f . 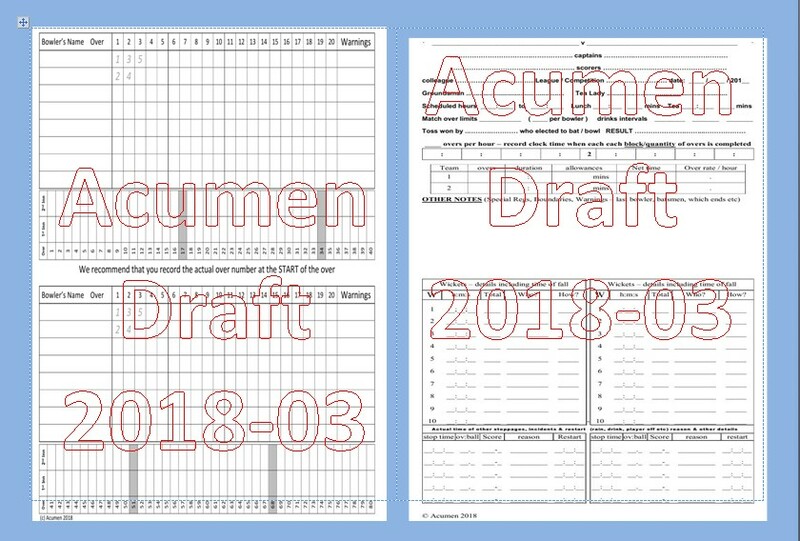 01jul06 Acumen has now set up an open discussion forum – to seek your views on proposals by Institute of Cricket Umpires & Scorers and controversial opposition from Independent Cricket Officials. Please visit Acumen Discussion Board and have your say. 04mar06 AMENDMENTS to Tom Smith 2003 edition - www.acumenbooks.co.uk/jts0601.doc a short downloadable list provided by Stan Bennett. 18Feb06 ACU&S has a temporary new web site and members are encouraged to click the NEWS link where they can read reassuring statements about insurance etc.